As a for sale by owner, you need to leverage every marketing tool you’ve got, and holding an open house can be an extremely effective way to bring additional traffic to your home. 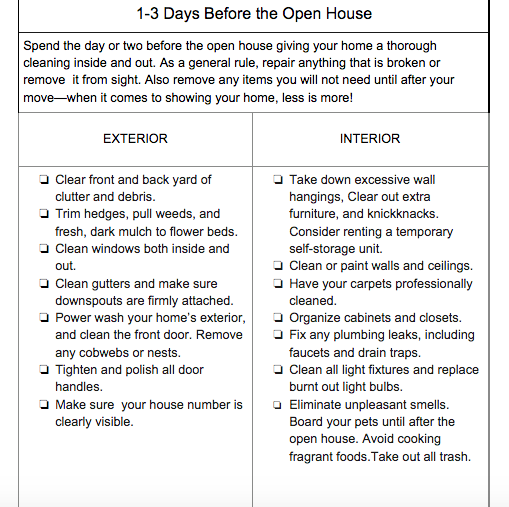 Below is a chart that gives you everything you’ll need to hold the ultimate open house. Your goal in holding an open house is to gain additional traffic and buzz around your home, and put yourself in the path of finding a buyer that may otherwise not have seen your listing. Your open house goal is to find just two potential buyers for your home. Hold just two open houses per week, and in just one month you’ve got almost 10 potential buyers for your home! Walk through the entire open house process, before, during, and after the event. Practice scenarios that you’ll have with the buyers and their agents. Start inviting people to your open house. Schedule one month of open houses. Create an action plan for this weekend. An open house is just something that has to be done when selling your home, right? Not really. When open houses are executed with purpose, it is a sales event that is followed up with a systematic process and surrounded with opportunities to find a buyer. To get the most out of your event, organize your open house into three phases. The foundation of a successful open house is in the preparation. Call all friends and family, previously interested buyers, and create a Facebook event. Your goal is to place signs where the highest amount of traffic drives by your home. It could be down the street, it could be three or four blocks away. You want to be strategic as possible when placing your signs. For weekend traffic, place signs near local grocery stores, strip malls, and major intersections. Be sure to post your address, day, and time of your open house. Capture workday traffic. For a weekend alternative, place your signs near the closest major intersections to your home during workday rush hours. Thinking outside of the box, consider holding an open house directed towards stay at home moms. This would take place during the afternoon between 1 and 3pm. Signage is a relatively inexpensive and effective marketing tool. You want as many people as possible to see your home’s signage over and over again. Pick up signs from Build-a-Sign. This is an awesome upgrade to using the red and white signs that you can buy from the local hardware store. They look super processional, and also serve as a deterrent to keep real estate agents who are just trying to list your home at bay. Drive through your neighborhood from a few different vantage points. What routes would most people take to get from busy intersections to your home? 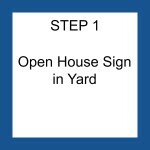 You want to make sure that your open house directionals are seen by as many people as possible. Think about how many turns it takes to get to your home from a highly trafficked intersection. If it’s more than four or five, turns, it may be too many. Be a friendly neighbor! 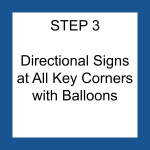 Before placing directional signs in someone’s yard, knock on their door and ask permission. This also serves as a perfect opportunity to invite them to your open house, and drop off a brochure. Decide when you’re going to put your signs out. The Friday before, is a great time. Place a few gallons of hot water in your car. This makes it easier to stick your signs into hard or cold grounds. Your plan of action: Plot your signage. Check out Google Maps and determine how many signs you will need. Schedule a time to purchase the products for your open house. Schedule a time in your calendar to place signs, both before the event, and to make sure they are still up on the day of the open. Invite people to your open house by actively generating traffic. 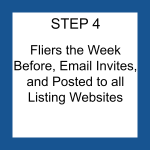 This is a critical strategy that will maximize foot traffic to your event. As an agent, I would routinely walk the neighborhoods of each one of my listings, and door-knock 100 neighbors. Knocking on 100 doors will require speed and efficiency. You want to reach as many houses in the fastest amount of time as possible. Walk quickly, and try to keep your conversations as short as possible. Before you leave each house, give your neighbor a flyer that has the date and time of the open house. If no one is home, just leave a flyer at the front, or garage door. Schedule times in your calendar to door-know your neighborhood 1-3 days before your open. This can be done all at once, or broken up over three separate days. Schedule a time to design your flyers. Edit and proofread your flier to make sure that the time and dates are correct, and that you are using the best 3-4 photos of your home. Also, be sure that you highlight the best features of your house. 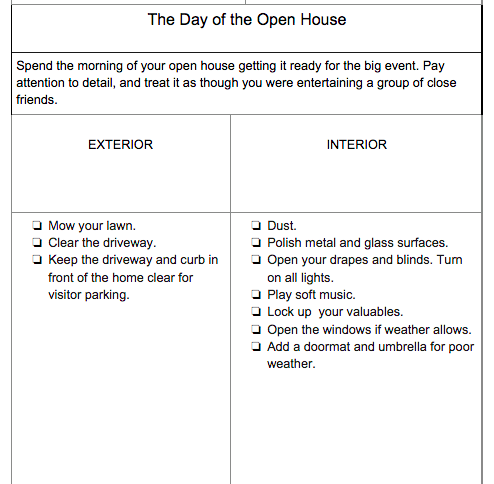 Use email and Facebook to let your friends, family, and co-workers know about your open house. Create an event on Facebook , and be sure to publish your open house on Zillow, Trulia, Cragslist, and wherever else you have a listing presence. Preparing your home for the open house starts a few days before the event. It involves a lot of cleaning, and organizing up front, but will pay off in the end when you make an awesome first impression on all of your prospective buyers. It’s best to ask your open house guests to “sign-in” on an Open House Registry. This practice is widely accepted by buyers visiting opens, and gives you the ability to follow up with your buyers once the open house is finished. Ask your buyers to sign-in with this script after you’ve introduced yourself and made small talk with your guests. Before you take a look at our home, I do ask that everyone please fill out this registration form. Thank you! Are you in the market for a new place? I always ask “Would you like a tour of the home, or would you prefer to see it on your own?” This serves as a bit of an ice-breaker for the sometimes awkward silence after a conversation. If they ask for a tour, keep the conversation going. If they’d rather walk through themselves, tell them to grab you if they have any questions, and that you have a brochure for them at the front door when they are finished. Pro tip: When giving a tour of your home, always walk behind the buyers, leaving yourself a safety out just in case. Never allow yourself to be backed into a corner, closet, or basement area. For a professional look and feel, I recommend picking up an Open House Resistry like this from Amazon. You can click the link here, or find it an many other useful real estate tools on our Resources page. Don’t be surprised when three or more groups come in at the same time. Ask as many questions as you can to quickly identify who is in the market for your home, and who is just looking. 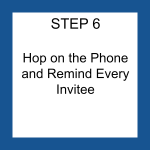 If you get overwhelmed, and cant get to everyone, at least make sure everyone signs in so you can call them back ever the event. You came through our open house today, and there were just so many people there that I was not able to welcome you properly, and spend as much time with you as I wanted. Did you have any questions about my home that were not answered this afternoon? Have a list of friends, family, and co-workers close by, just in case you have extra time to make calls. You can also post live photos to your Facebook Event/Feed to continue the buzz from earlier. Safety tip: Check to make sure that all doors and windows are locked after the open house. This is not extremely common, but thieves have been know to visit open houses, unlock a back window and return later to break in. 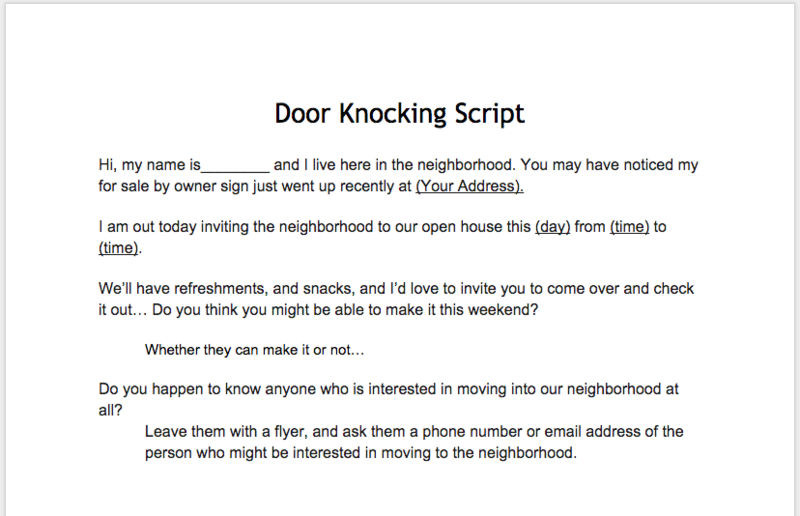 Use the script below when calling open house visitors the day after the event. If no answer, send an email with the same wording as the script below. Repeat daily until you connect. Hello (Guest), this is (Your Name) from the open house at (Your Address). I wanted to give you a call to thank you for visiting us yesterday. Did you have any questions that wne unanswered yesterday? Does my home have the right number of bedrooms and bathrooms that you need? Is it in your price range? Have you been pre-qualified to buy a home yet? Would you like to set a time later this week to see it for a second time? You’re ready to hold the Ultimate Open House! Now is the time to take massive action, and really get after it. 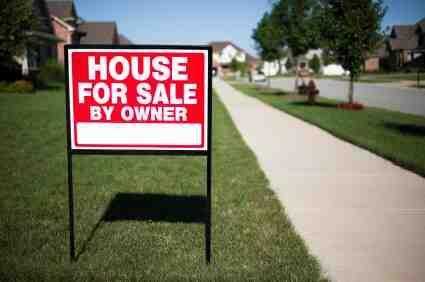 Don’t just put a few signs out, and post your open on Craigslist and Zillow. To get the most from your open house, you must really make it an event. You have to take the mindset of a real estate agent, and throw everything you’ve got at this. From the graphic at the beginning of the post, I show you how to create the ultimate open house in six steps. 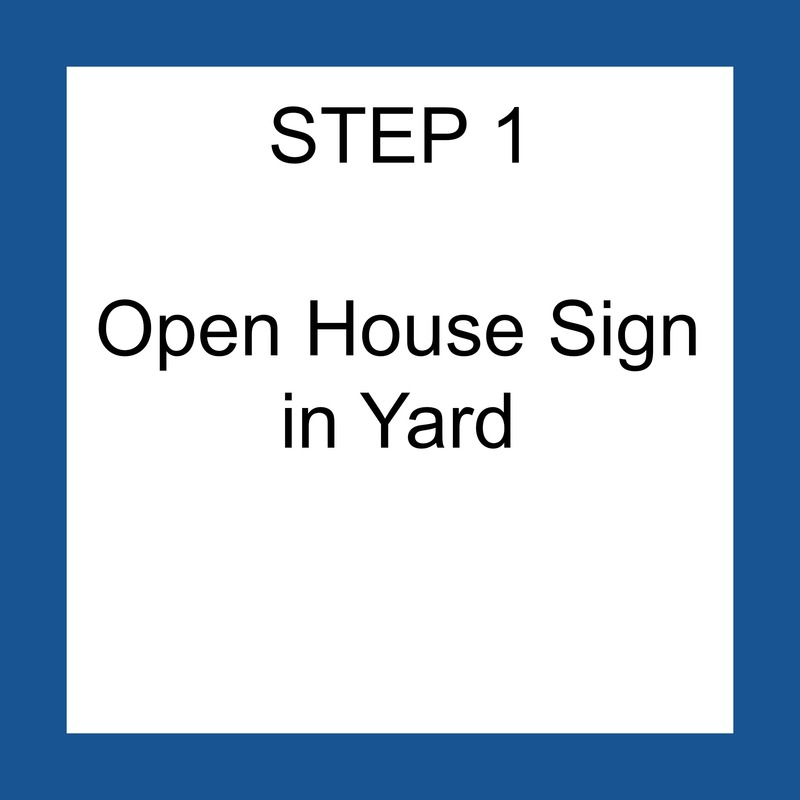 Place your Open House sign in the yard on the day of the event. Put out open house riders (“Open House – Sunday from 12-4 – 1234 Main St”) on busy intersections a few days before. Add balloons the morning of the event. Put out directional signs the morning of the open. Create flyers ahead of time so you can pass them out in the middle of the week. Create a Facebook event, and prepare and publish ads on Craigslist, Zillow, Postlets, and other sites that you are listed on. 3-4 days before the event, invite your friends, family, and co-workers. Get out and invite 100 neighbors to the open. Leave a flyer at each home. Hop on the phone and invite previously interested buyers, freinds, family, and co-workers. How to organize your open into three separate phases: before, day of, and follow up. 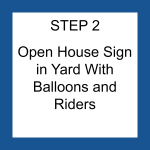 You have planned your next open house, and are buying proper signage. You are creating buzz to drive traffic to your home. You are scheduling your buyer follow up calls, and emails after the event. You now have the guide at hand to hold the ultimate open house. Like what you’ve read? Please “like” and share with your friends. If there is something that I’ve left off, feel free to leave a comment in the comments section below. I saved $5,490 in real estate fees, and sold my house in less than two months. We were able to close quickly, and move into our new home just as soon as it was finished. FSBO Method is awesome. Hi! I'm Nathan Crooks, and I'm the dude behind FSBOMethod.com. 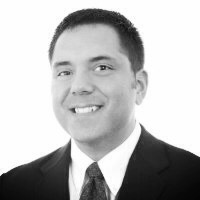 I spent 5 years as a real estate agent with Keller Williams Realty, and Reece & Nichols Realtors in Kansas City. My goal is to teach you how to sell your home without using a real estate agent, and save thousands of dollars in commissions.